When the calendar said March 1st, everyone with a Jio SIM rushed to get the Jio Prime membership. Sadly on day one, the payment gateway of Jio Money failed and many people had the amount withdrawn from their bank accounts but their Jio Prime membership was not activated. On day two, Jio changed the payment gateway from Jio Money to BillDesk which solved the problem. Sadly, the people who lost their money on day one have to wait for indefinite period of time to get their money back or their membership activated. Normally if you are a Jio customer you get 2am to 5am unlimited 4G data usage. This feature is particularly useful for Jio Cinema which allows you to schedule downloads between this time period. The download between 2am to 5am is not taken into account from your 1GB of high speed data usage. This means your 1GB remains free for the day. Sadly if you have taken the Jio Prime membership then night unlimited feature gets nullified. As you can see from the screenshot below Jio has charged from the 1GB daily quota when I downloaded a few files before 5am. 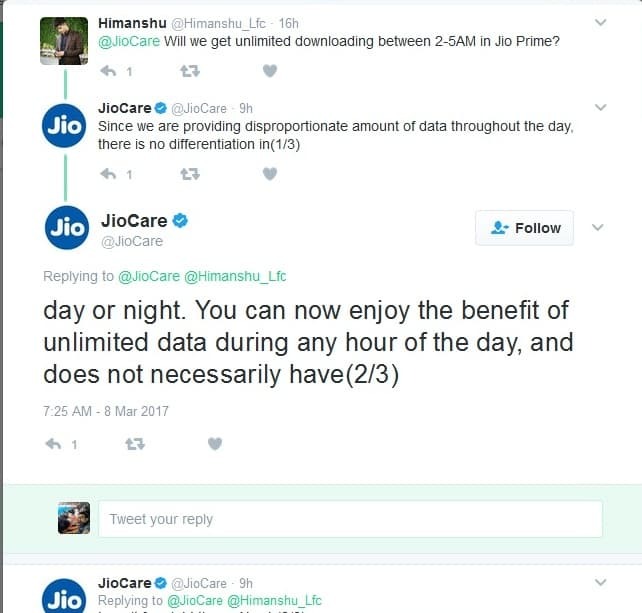 Will unlimited night data be available to Jio Prime members? Since we are providing disproportionate amount of data throughout the day, there is no differentiation in day or night. This is hugely beneficial for the customer, as the customer can now enjoy the benefit of unlimited data during any hour of the day, and does not necessarily have to wait for night time. Jio forgot that after 1GB you are stuck with excruciating slow 128kbps internet which does not even suffice for WhatsApp. If you thought okay I shall recharge for Rs. 99 at the beginning and leave my Jio connection unattended until I need it, you were badly wrong. You have to recharge the minimum plan which is Rs.149 per month otherwise your Jio Prime membership may be deactivated. If you do not recharge for more then 90 days then your Jio connection will be disconnected. Here is what Jio says about it. Will my membership end if stop recharging after few months? Jio Prime customers need to recharge with a minimum of Rs. 149 per month. In case there is no recharge of minimum Rs. 149 per month, the Company holds the right to deactivate the Jio Prime subscription of the customer. The user device may be used as a personal hotspot connection (this is also known as tethering) for upto 1 device only at a time. Disclaimer: We do not know how they plan to implement this restriction. If you are a postpaid customer and you opt for Jio Prime then you also have to opt-in for e-bill and autopay. This means if you want or not money from your bank account will be debited on the day of due. Yes, voice is truly free. Video calls which are becoming the new fad among people in India will now cost you money (balance) and data. The charges for making a video call is 5p/sec. The data that you incur while making a video call will be deducted from your daily/monthly quota. We are claiming the next message in this thread for more scoop. I think this is actually good. Because unlike other post-paid plans, you'll already know what you'll be paying. If one goes with the Rs. 303 recharge and stay within the limits; you'll know your exact bill. I've been on the auto-pay for electricity bills for years now. I think it works good. Yeah, but they were never free. I feel sorry for the people who'll use WhatsApp to make 'free calls'. For all the local audio calls, there's no point in using WhatsApp or Skype; but for International calls; we don't have an option. I think it's all going in the right direction. My personal interest is in the Jio Fiber service. I hope to get in as early as I can. WhatsApp been failed for Voice calls. Skype is just okey. They don't have HD even over very good broadband. Regarding, unlimited voice. I read somewhere. Q. If a user is on Jio Prime + 149 Plan. Will Jio apps eat data pack of 2 GB or its free? @Anoop Kumar - Jio has already clarified that the voice calls would be totally free and not just for 1000 minutes. The AMR-WB codec (for HD calls) would likely consume not more than 5.5 MB of data for an hour-long call. I don't see even the most frequent voice callers consuming more than 10 to 15 MB of data per day (we're talking about the absolute peak numbers). I'm using information obtained from multiple sources; but tagging @ash and @durga to help with the math of VoLTE calls. Voice calls are absolutely free. 2GB of data will be consume only when you turn on the 'data' connection and use the Internet, WhatsApp, Facebook etc. You'll be able to make voice calls even when you've exhausted all your 2GB of data. The most dangerous thing about Jio: Absolutely no reliability where call will connect or not. Now a days I am trying Jio VoLTE for calling. It has been hit or miss. In evening time, getting error like "can't connect to server"  . Now with these kind of things I am skeptical whether to get JIO prime or not. Even if I am going to use Jio as backup only. I spoke with an official Jio representative and he 'unofficially' confirmed that the services will see improvement post April 1; as the money starts flowing in. I've not faced issue calling to other networks from Jio yet. But in the last 3-4 days; the data service has become totally unreliable. I did get speeds up to 20 Mbps on a few occasions; but since last few days; it just doesn't go beyond 2 - 3 Mbps. I'm not a heavy data user on mobile; so it does the job for me. I can stream songs without issues; but loading YouTube video takes some time. I am not sure about the late night free offer being discontinued if you become a prime member, I have become a prime member on 3rd and I did manage to download few gig of data on 6th. Secondly with reference to speed, can you let me know whether you just do a speed test using the speed test website/app etc. If so I think you don't get to see the maximum speed. The traffic shaping algorithms appear to give exponentially increased bandwidth if the socket is open for a longer time. i.e more than 30 seconds to a minute. Where I live, with speed test I get 12-16Mbps (My signal strength is -76dBm on Band 3 and 5, -86dBm on Band 40). But at any time of the day(not necessarily late night) if I download a large file on P2P Immediately the download speed goes to 33Mbps. If you have a Jiofi device you can easily see the download data rate assigned to your connection. For any HTTP activities it stays at less than 100K - when I type this the data rate is 628bps. For youtube if you just watch it, youtube itself alters its buffering based on your connection and doesn't dump all data at once as it assumes you are on a slow connection due to the jio traffic shaper. However if you download the same youtube video using youtube downloader - the socket is open for longer, you tube doesn;t bother about your bandwidth and you get the full file quickly. All this is fine, however I don't have a volte phone and the Jio voice app seems to have issues with codec or they haven't configured their switches correctly to convert ip calls to circuit switched. I get exceptionally good quality audio when the other party speaks, however they are unable to hear me well, voice cracks, packets lost. I called Jio customer support they closed the call saying all is well. However today a call centre guy said it is an app issue and everything is fine if you use a volte enabled phone. If any of you have a volte phone (i.e able to call with out the jio dialler app) can you please confirm how is the call quality to the other party. With reference to tethering - I think these terms and conditions are written - to be precise copied from western world. 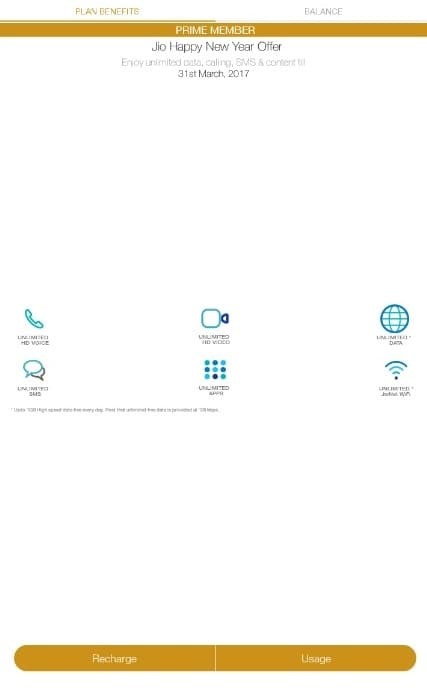 In Europe the terms and conditions for tethering is specified as Jio's terms - the reason is they have different plans for business and consumer and it is all based on billing address. A country where no one really follows any rules - you believe that tethering more than 1 device is going to be an issue and do you believe they are going to disconnect you for tethering more than 1 device. Prime will come into effect starting April 1. All of us are currently on the Happy New Year offer. Yes, Prime will come into effect from April 1 but if you have purchased Jio Prime by paying Rs. 99 then your night unlimited feature stands cancelled even if you are on the Jio Happy New Year offer. Here is a screenshot of the MyJio app when you have enabled Jio Prime and as you can see I am still on the Jio Happy New offer but still Jio is charging me for night unlimited as I went for Jio Prime. How much did they charge for your night usage? They did not charge me but took it out of my 1GB of daily quota. This did not happen before I enrolled for Jio Prime. The frustrating thing here is that they do not say the word "NO". They give the same explanation as before. After April 1 the late night offer doesn't exist as per their call center guy (even though their website FAQ gives a stupid answer). I can confirm you still have the unlimited download between 2AM-5PM even if you are a prime member till 31st March. I tested it last night I was able to download 5GB between 2 and 5PM and nothing got deducted from today's quota. I could test calls from Jio to idea cellular and didn't notice any significant difference in the call quality. Both incoming and outgoing calls were just as good (or bad) as earlier. Never had call drops either. O was told that the network quality will improve starting April. I have no complaints so far. Hi i am using volte phone and the call quality is very good. even I have tested on running train between Patna to Gwalior / Delhi it's working good compare to other operators. yesterday tested the speed of Airtel 4G in Gurgaon it's hardly 4MBPS. My thinking was now other operator networks are free & i will get good speed. so should i go for another Jio or not. i can recharge my airtel no. But yesterday test disappointed me. earlier in same location speed is around 25 to 30 Mbps. Has any one has any comment on voice quality using a volte phone. Was the other end person complaining in your case about your voice not clear etc - in my case I have a non LTE phone and I use the app - I can hear the other person as good as a high fidelity music, however the other end person complains that the voice is breaking up. yes voice quality is very good. even i have check 2 hours video call quality is good. both side jio with volte phone.